Nicholas James O Toole died of a nose bleed caused by Spanish flu on the 12th August 1918 at Little Scotland near Hacketstown Co Carlow. 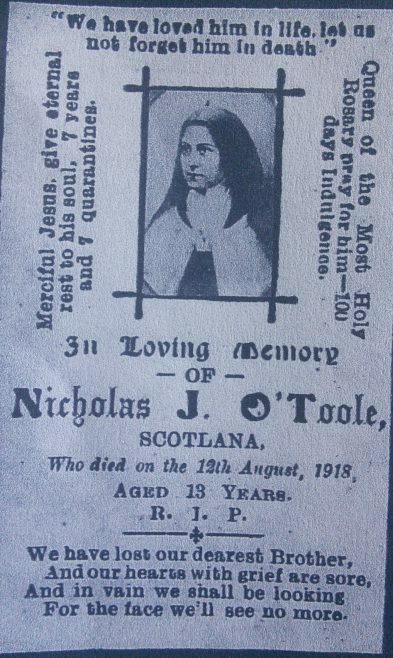 He is buried in Knockanna Co Wicklow. My father Kevin told me he remembered this sad event, he would have been four years old. Nicholas was born in Cairns, Queensland, Australia before the family returned in 1911 to take over the family farm at Little Scotland. I was prone to nosebleeds in my childhood and these lead to total panic in my family and only with hindsight do I understand why. A bunch of keys on the back after the neck was one of the remedies tried to stem the flow.